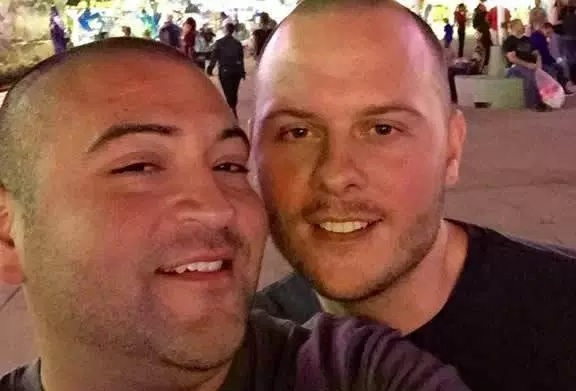 A few weeks ago, I reported that one of the police officers, a gay man named Jesus “Jesse” Retana (pictured left), was shot in the tragic shooting incident following a peaceful Black Lives Matter rally in Dallas. Sadly, Retana is facing a lengthy recovery and a thirty percent cut in pay! According to Retana’s husband, Andrew Moss (pictured right), he faces “a long road to recovery,” including surgery and physical therapy. Unlike the Dallas Police Department, DART doesn’t offset the pay reduction officers receive when they apply for workers’ compensation. Moss has launched a GoFundMe page to help with all the expenses but it only brought in $185 in five days! If you'd like to donate to their fund, click HERE.